The containers are from the MSC Flaminia, which caught fire in the mid Atlantic in July. CONTAINERS OF POTENTIALLY dangerous chemicals have been retrieved off the west Cork coast, after they fell from a badly damaged German ship. The MSC Flaminia was carrying 2,876 containers in the mid Atlantic on 14 July on its way from Charleston in the US to Bremenhaven in Germany when an explosion on board killed a crew member and left one missing. One hundred and fifty one of the containers were classed as dangerous goods, holding flammable cleaning fluids. There were also 1,247 tonnes of crude oil and 680 tonnes of diesel on board. 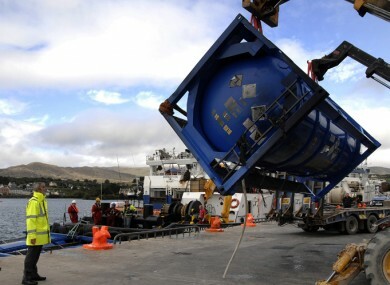 Some of the containers which fell from the ship have shown up off the west Cork coast and have been towed ashore to Castletownbere by the Ocean Bank tug. The MSC Flaminia finally docked in Germany five days ago, after remaining in a holding position off the Cornish Coast since the blast awaiting a country that was willing to accept the ship. It was towed to Germany after receiving permission from British, France, Holland and Belgium to travel through their waters. Aerial surveys of the ship found that no liquids had leaked into the water following the explosion. Email “Potentially dangerous chemicals from stricken German ship head for Cork coast ”. Feedback on “Potentially dangerous chemicals from stricken German ship head for Cork coast ”.